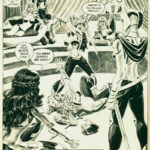 The entire Metal event within DC Comics has allowed the company to introduce some new characters and bring in lesser used characters. 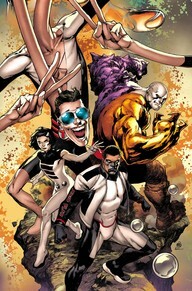 The newest series to emerge from the actions with the Metal series is The Terrifics. Mr. Terrific is back from the Dark Universe after trying to help Batman and other heroes. In his return he has found that his company has been taken over by one of his greatest enemies. As greatest enemies are bound to do, Mr. Stagg is using the tech that he has acquired to try and open a portal to the Dark universe. As Mr. Terrific tries to warn of the dangers of opening the portals he finds that Metamorpho is being used to open the portal and he is too late. Mr. 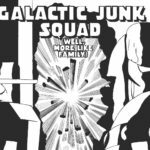 Terrific, Metamorpho, and Plastic Man are all sucked into the Dark Universe as they follow a beacon of others from the regular DC Universe who have been trapped. The Terrifics #1 throws the reader right into the action. My summary may sound like I have told you the entire first issue bit that is just the first couple of pages. So, while this first issue has a lot of set up there is plenty of action to keep the story moving along at a brisk pace. Although the story moves quickly it never felt as if the story was being rushed. That is partially because a majority of the story focuses on just the three characters and how they have been directly affected by the events of Metal. Thankfully although The Terrifics #1 comes directly out of the Metal series it does not feel weighted down by the series. Any connections to Metal are explained in a manner that is easy for the reader to understand. While I do not think that the first issue is weighted down by the Metal series, I do think following that series will up the enjoyment here. It is like trying to read a stand-alone story in a spinoff. You might not need the original but knowing the original will increase the enjoyment of the series. Reis is able to save the book with his art. His character designs are compelling, and you get the appropriate reactions throughout. The designs of the strange realms and settings really allow for Reis to show of some creativity. Meanwhile Mialo is creates vibrant and unique looks with his coloring through all the realm hoping and explosions. The Terrifics #1 has a ton of potential but not much heart to the story so far. The biggest issue is that you have four characters who have little history brought together but little to no reason why. Maybe later as the series moves on the motivation and synergy will be there but for now it feels like DC wanted to create a Fantastic Four without the actual family.